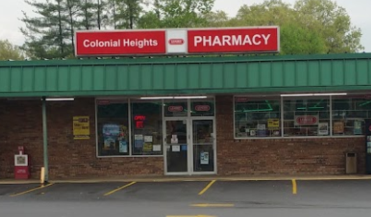 Colonial Heights Pharmacy has been serving the community since 1956 with the same commitment: providing old-fashioned service to our most valuable asset, our customer. At Colonial Heights Pharmacy, we pride ourselves on customer service. That’s what keeps bringing our customers back! We at Colonial Heights Pharmacy strive for excellence in our customer service and want to see you come back again and again. We all know you can go just about anywhere and get a prescription filled, but wouldn't you feel better knowing the person you got it from? Us too! We at Colonial Heights Pharmacy pride ourselves on getting to know our clients and making them feel comfortable...not something you will get at a bigger retailer. We are currently in the middle of a remodel! Soon we will have a new OTC sections and plan on bringing in news lines for our gift section. Swing by and see how we have updated our shop. Please contact us with questions or concerns at info@colonialheightspharmacy.com, 423-239-9191, or just stop in! We’ll be happy to help!